MOMS: Didn’t you used to smoke when you played for Villa? Shaun Teale: Yes, I smoked until about four years ago. I had my first cigarette at the age of nine. Nine? Bloody hell! I remember reading about Juventus, I think in the 90’s, apparently they were so fit from their preseason regime, that some of the players would have a cigarette and even a small glass of wine at half-time to take the edge off. I didn’t quite go to those extremes! So when was the last chance to get a cigarette in before a game? Depending on where you can hide. Honestly, some of the places I’ve ended up in grounds is ridiculous. I’ve ended up right at the back of stands, I’ve ended up in stairwells, often creeping out when the supporters have gone. So when was your last cigarette before the 1994 Wembley Cup final, for example? That was difficult. We stayed outside of London about three-quarters of an hour away from Wembley, so probably literally two minutes before I got on the coach. I checked out, disappeared outside, shoved my bag on the coach and just found somewhere round the corner while I waited for everyone to come out . I must have stunk of cigarettes pretty much all the time I played, because I was always having a crafty one. For example, when we played at Maine Road, as it was then, Keith Curle, the City centre-back smoked. We were in the bar after the game and I was looking around, thinking ‘Where can I go?’ and I noticed a sign for a toilet. I went out the door and it was through a corridor, out into the bottom of the stand. I walked into this toilet and who’s in there? Keith Curle and he’s having a cig already. It must have been his standard place. So there’s Keith and I, after the game, having a cigarette and having a pee! So, I take it, it’s pretty rare for players to smoke? I think it was just seen as a no-no really, but in truth there was a lot more that did it than people knew about. I would have never have walked around Birmingham or Sutton Coldfield where I lived, smoking, I would have never have done that. Kids look up to you, and for them to see you smoking, is not the right message. But, when I was in the car, yes, I‘d smoke all the time. As soon as I’d get into the car park at Bodymoor, I’d light up. In fact, half the time, I’d light up, before I moved my car. The point is Ron knew I smoked, every member of the staff knew I smoked. On away games, famously, there was only two players who had their own rooms, me because I smoked and nobody wanted to share with me, and Paul McGrath, because he drank so bleeding much. It sometimes works out having vices! Yeah, so we had the luxury of having our own rooms, the card school would always be in my room, so I could smoke while we played cards, which wasn’t always a good thing, because if you got caught with everyone in your room, you’d usually end up with a fine. So you have to be a bit careful. Did you ever get fined? Errr, not that I’m aware of. I don’t think Paul McGrath actually got fined, if the truth be known. It was good to tell the press that at the time; when he didn’t go to Exeter and when he didn’t play against Liverpool, and Ron put in the press he’d been fined two weeks wages. Do you keep in touch with any of the guys from the Villa team back then? I spoke to Dalian recently, I speak to Deano quite often. I spoke to Tony Daley at a former players do, he’s obviously still at Wolves as a fitness coach. Spinksy is at Bristol City as goalkeeping coach. I speak to Froggy on Twitter. There was all kinds of things that used to go on. There used to be the odd fight that would break out in training. It was pretty intense at times, as everyone wanted to play, and not everyone could play, so people would get riled. It was a big shame Froggatt was injured for that Wembley final. I remember giving him a call the night before to wish him well on the day. What memory stands out for you from the final? [Laughs] Cheers! They’ve got Sparky [Mark Hughes] and Eric [Cantona] up front and I’ll look after f**king Stan as well! But in a weird way, it worked, because we shut Kanchelskis completely out the game between us and I think Stan lasted until the about the 65th minute. Yeah, and of course, Kanchelskis then had a bigger hand in the game as anyone else… There’s a f**king pun for you, if ever there was one! [Kanchelskis gave away a penalty and was sent off for handball]. My abiding memory is we played so well on the day. To be fair to Ron – and I’m not a big fan of his, tactically, he’d never win a league because he’s not tactically astute enough to do that, but he’s good in a one-off game – he pulled the Graham Fenton rabbit out of the hat and played five across the middle and Dalian Atkinson played right-wing and Tony Daley left-wing and they didn’t know how to handle us. It looked like we just had Deano upfront and so your Steve Bruce’s and Gary Pallister’s were just lost on the day. 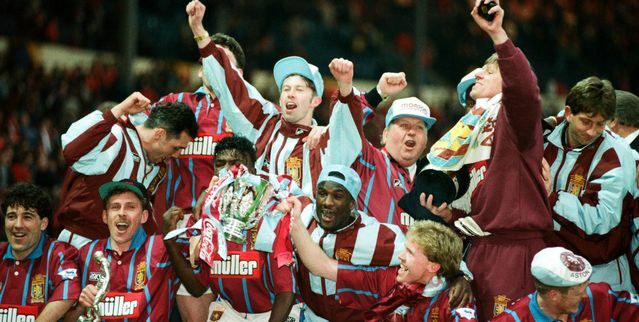 Steve Froggatt (centre in cap) avoids doing a ‘John Terry’ by keeping his tracksuit top on, when Villa celebrate their cup triumph of 1994 at Wembley. I interviewed Eric Cantona a few years ago, and I couldn’t resist mentioning being at Wembley for the game. He said, I only remembered it because it was the only and probably last time Villa will beat United. Yeah, and Les played in goal. Les, another smoker! Obviously Les had been at Villa for two years before going back to United, god rest his soul. But what an absolute crackpot! In the same breath, you’d never meet a nicer person. So did you have a cigarette with Les after the final? [Laughing] No. He could barely talk. Honestly, I’ve never seen him so down. He looked like he’d been run over by a f**king train. We went in the bar at Wembley, after the game, and he just looked completely and utterly disconsolate. But was he a smoking partner while you were both at Villa? I signed for Villa on a Monday and we flew to Germany on a Tuesday for 10-days preseason, and obviously the smoking issue came up. I had a ciggie in the toilets in the airport, which could have got me f**king thrown off straight away. You could still smoke on the plane at this stage, but I didn’t. I got off the plane and disappeared and had another one. The lads always knew where I’d gone. No. Then I got to the hotel, which was a sports hotel up in the hills near Hanover. There was a village a good ten-minute walk down the hill. We got to the hotel and Jim Barron is dishing out the keys in reception, and he’s gone ‘Shaun, you’re with Les”. The only thing we didn’t bank on was bumping into Mr McGrath in the corner of a cafe, slumped there paralytic. So there went the smokes on the way up, because we had to get him into a taxi and take him back to the hotel. So there’s the famous story, that he was that pissed, he came out for training in the afternoon and we were playing head tennis on an Astroturf pitch and he came out in his studs – he was pretty much like bambi on f**king ice. So Ron had flown back that day to England to do the David Platt deal to Bari, so Andy Gray took the training session. They threw Paul out of the session after 10 minutes, because it was obvious he was ars*holed. Jim Walker took him to his room, took all his money off him and locked him in his room, thinking that was the end of that, he’d sleep it off and he’d be alright later. They found him an hour later, sat in the bar, drinking even more, after he shimmied down the drain pipe, then told the waiter to put the drinks on Aston Villa’s bill. Well, I did have a tendency to also not like managers right throughout my career, I didn’t get on with any of them really. So, how did that relate to your stint as a manager? I was a player-manager [of Burscough F.C. ], it was a bit easier for me, because obviously I was on the pitch with the lads. I was the senior, senior pro, because I was 40 then, and I had that respect off them for what I had done. I never had any issues with any of my players. If they had any issue, they’d come and knock on my door straight away. The door was always open to the lads. So, you were a bit more on the player’s level socially too? We’d have a real good training session for a couple of hours, then we’d more or less all go and have a pint together. Just one, then we’d jump in our cars and go home. It became a religious thing after training, even more so for the trip to Villa Park for the FA Trophy final. Teale lifts a trophy on his return to Villa Park as player-manager of Burscough F.C. This is like the Brian Clough approach to management, where at away European games he’d have the players down in the hotel bar for a whiskey the night before game to relax them. Ron [Atkinson] used to do it on the day of the game with brandy. He’d give us a tot of brandy before we went out. The only thing is anything like that repeats on me. I did it once. I spent the first half burping in someone’s ear and the second half, breaking wind and stinking everyone out. I thought this isn’t a good thing, so from then on I left it to my centre-half partner to sort it out. So I used to get the brandies in and he used to drink them. He was banned from having any. So I used to get one. Paul used to sit next to me in the dressing room and I’d put it by the side of me, and by the time I’d blinked, it was gone! So that’s how I played it as a manager. We didn’t get s**t-faced by any stretch of the imagination. We had a big game of cards in the hotel bar and had about four pints. We were on a Guinness binge at that time, so we were always on Guinness, so that was good for the old strength. With my contacts, I sorted it so we trained at Bodymoor, which was unbelievable and god bless him, Ian Paul washed the kit everyday for us and hung it up; they treated the lads like they were real pros. We did the tour of the stadium on Saturday morning. I then took my assistant manager in to see Mr Ellis, which was hilarious, but I’ll tell you about that another time, as it goes on for hours, as Doug does. We turned up on the Sunday super confident after the rounds we’d been in, that we were going to win it. Rightly so, we played Tamworth of the park, I thought. Apart from the European Super Cup in 1983, there’s not many players that have actually lifted a cup at Villa Park. No, and I got sacked five weeks later. The joys of management! (click here for Part One). when will part 3 be ready? Chris26 I was thinking about that the other day. Sooner rather than later, if I have time, hopefully the next couple of days. MyOldManSaid Chris26 ok cool cant wait!!! !